With the joy from the Homecoming football game, I looked back on what I have seen and experience throughout this week. It was a true Homecoming. The Friday night was my favorite part. First came the parade, and the Chvrches Concert right after that. I could tell everyone was excited to see the Homecoming Parade. At that moment, the whole Iowa City was filled with pleasure, excitement and fun. My friends and I were waiting right east of the Old Capitol facing the Iowa Avenue. It was literally one of the most famous spots: the density of people can not be expressed by an exact number. Tons of people have already arrived and it was hard for us to find a spot to stand. Hundreds of people were still heading towards here. Kids holding big plastic bags stood in line in the front waiting for candies. I would say that the Iowa Fight Song was the highlight of the parade. Because that was where our Hawkeye Spirit should belong to. The Chvrches’ Concert was another highlight of Friday. I felt that I was fully into the music and absolutely loved it. It was a great time to relax from the busy midterm week. Although surrounded with people like a sardine pack, I didn’t even want to move. It was nice and warm here in the crowd because people together as a whole was the biggest defender of the wind. Music was not only functioning as music anymore but also as the pain-killer for people. Forget all those unpleasant things, and let’s have fun at Homecoming. 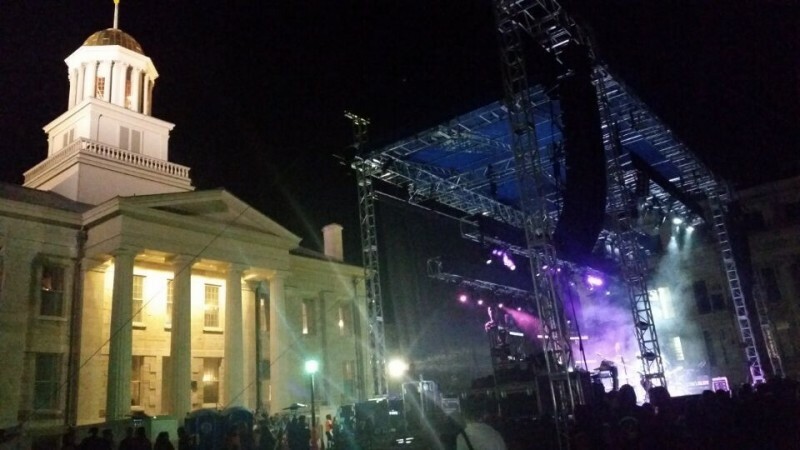 The old Capitol was a little bit different that night– it was more honorable and sacred by the comparison of the dark night; and the night was special because of the Homecoming! !